New from Lulu Guinness: Cast A Spell (shown), "inspired by fairy tales like Cinderella and Sleeping Beauty". The fragrance includes notes of dark berries, frosted blackberry pulp, mulberry, red currant, iced lavender, lilac petals, davana blossoms, black velvet fig, amber, bourbon, and white patchouli. Lulu Guinness Cast A Spell is an Eau de Parfum, and is available in 30, 50 and 100 ml. Available at sephora. 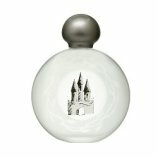 Update: Elternhaus MoslBuddJewChristHinDao is now available at luckyscent, where it is $300 for 50 ml Eau de Parfum. More on the debut fragrance from Australian natural skincare line Aesop: it was named for and inspired by Marrakech, and the notes include patchouli, cardamom, ylang ylang, sandalwood, clove, jasmine, neroli and rose. (via vogue.fr) Aesop Marrakech is available in 10 ml Parfum or 100 ml Eau de Toilette. L, the only place I've seen the Aesop so far is Colette, but Sephora in the US carries the line so hoping they'll get the fragrance eventually. Why aren't those Fragonards listed on their website??? I don't get the Barneys catalog so know nothing about them other than what I read on Life in Paris. Hey, looking in the catalog to share info with you, I note that Armani Prive scents go for $185 here. Brilliant me just paid $210 in Paris for the privilege. Ahhh, the exchange rate and the weak dollar. And the weak brain. Back in a minute with Fragonard info. Soudain: Italian green mandarin, lemon, Guatamalen cardamom, jasmine, orange blossom, Paraguayan gaiac wood and musk. Sounds great, eh? Cette Nuit La: Galbanum, neroli, essence of coriander, Bulgarian and Turkish roses, iris absolute. Apres Tout: Bulgarian rose, Sicilian bergamot, essence of rose de mai, violet, raspberry, crystal rose absolute, oak moss, amber and musk. Mensonge: grapefruit, ginger, green leaves, cardamom, nutmeg, clove, tea rose, jasmine, Haitian vetiver, sandalwood and lavender absolute. whew. that's a bunch of notes, all things considered. L — what a bummer, I am sorry! But yours is from Paris, so it is more special, right? L, you are a dear! Will post those tomorrow. Soudain sounds fabulous. Mensonge sounded great until I hit the lavender. The other two are maybes. “Cast a Spell” sounds delicious, but I'm left wondering what makes the lavender “iced” and what makes the blackberry pulp “frosted?. Cooling does sound better than the other more sugary definitions of icing and frosted. I look forward to trying this one. Ah, Cara, you might be right, they might actually mean cake-frosting! In which case it probably won't be for me.